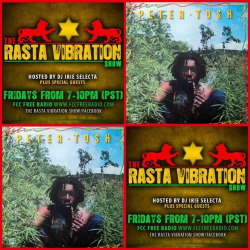 It’s all about The Rasta Vibration Show on FCC Free Radio tonight!!! We have our rescheduled interview with Gully Bop before his show tonight at New Karibbean City… We will also preview 2 new albums that came out recently… Mr. Vegas Lp Lover’s Rock and Soul and Macka B‘s new Lp Never Played A 45! It all goes down 7-10pm Cali Time with your host Dj Irie Selecta on www.fccfreeradio.com Live in Studio 1A and on all smart devices with the TuneIn radio App!!! Tell a friend!! !